Large commercial tractor-trailer trucks and 18-wheelers require an added level of safety because of the terrible damage they can cause in the event of a vehicle accident. When a serious truck accident occurs, investigators often find that transportation companies have kept poor safety records. 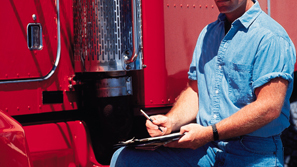 In December 2010, the Federal Motor Carrier Safety Administration overhauled the federal trucking inspection system. The FMCSA’s new Compliance, Safety and Accountability program measures the safety performance of truckers and transportation companies and assigns safety ratings and other records that are available for public review. The legal team at The Law Offices of Frank L. Branson has extensive experience representing individuals who have suffered serious injuries in truck accidents. Our lawyers investigate these complex cases to obtain important internal company documents and safety records that are valuable in determining fault and whether punitive damages are warranted. Our goal is to place our clients on a level playing field with the trucking industry so that their losses are fairly compensated. To learn more about our experience in truck company safety record matters, we invite you to contact the firm here.